Artograph is pleased to announce a new, improved edition of the popular LightTracer light box series, is now available. The new LED LightTracer and LED LightTracer2 now shine with dazzlingly bright LEDs. With maintenance-free gradient illumination from 5000 to 14,000 lux across the slanted surface, these new LightTracers are the brightest light boxes available. The LightTracers are entirely made in the USA, assembled in Artograph’s Delano, Minnesota factory, with parts made by other local Midwest companies. Not only is the quality higher than ever, but the products’ profile is ever more green and efficient. Even the cartons are locally made from 100% recycled materials. Features a 10 x 12 inch (254 x 305 mm) conveniently slanted lighted surface and handy recessed tool tray to keep pencils, chalk, embossing stylus, and other tracing tools at your fingertips. Now illuminated by maintenance-free, cool, bright LEDs with a sleek new design. For larger, more complex projects, take advantage of the Light Tracer® 2, with a generous 12 x 18 inch (305 x 457 mm) conveniently slanted acrylic tracing surface and handy recessed tool tray to keep pencils, chalk, embossing stylus, and other tracing tools at your fingertips. Now illuminated by maintenance-free, cool, bright LEDs with a sleek new design. Artograph is proud to bring this latest tool in our long line of successful Products for the Creative Mind® to the arts and crafts markets. 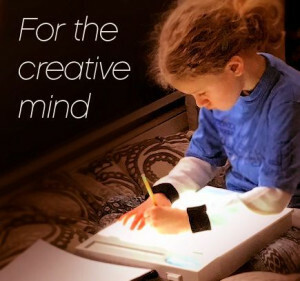 The LED LightTracer light boxes are a stellar addition to the Artograph tradition of quality, reliability, and ever-greener products for the arts.